The Beguiled is an atmospheric thriller from acclaimed writer/director Sofia Coppola. It tells the story of an injured Union soldier who finds himself on the run as a deserter during the Civil War. He seeks refuge at an all-female Southern boarding school where the teachers and students seem more than willing to help. Soon, sexual tensions lead to dangerous rivalries as the women tend to his wounded leg while offering him comfort and companionship. Premiering at Cannes this year, Coppola walked away with the Best Director award, making her only the second woman to ever win in that category. Anytime Coppola releases a new film it quickly becomes a highly anticipated project with her already having an acclaimed filmography with films such as The Virgin Suicides and Lost in Translation and being apart of the esteemed Coppola family tree which is led by her father, the legendary Francis Ford Coppola (Godfather Trilogy, Apocalypse Now). This time she tackles The Beguiled, a reimagining of the Don Siegel directed, Clint Eastwood starring film from 1971. Coppola had stated that she borrowed more from the 1966 southern gothic novel of the same name written by Thomas P. Cullinan. The ’71 film was told through the eyes of Corporal McBurney while the 2017 adaptation focuses more on the female centric ensemble that features Nicole Kidman, Kirsten Dunst, and Elle Fanning. After taking in a wounded enemy soldier (Colin Farrell), the group of women initially despise him, as time goes by they begin to grow fond of him and must not give into temptations. At 94 minutes, the film is tightly paced as the dreary Virginia atmosphere looms large. The minimal score is haunting while the color palette is bleak. As shown with Marie Antoinette, Coppola is able to establish different textures, such as a silky long dress that sweeps against a wooden floor while it creaks eerily. The Beguiled is aesthetically pleasing and shows there is more than what meets the eye. The entire cast is at the top of their game here, giving performances where they’re able to show emotion without having to say anything. Colin Farrell is great as the Corporal who makes the most of the hospitality that is provided by Kidman’s Martha Farnsworth. Farrell continues to prove his talent here as he once again takes on an independent feature that is sure to bolster his resume. 2017 seems to be the year of Nicole Kidman who had four productions screening at this year’s Cannes Film Festival and was awarded a special 70th anniversary prize. Between that and her vulnerable role on HBO’s Big Little Lies, it’s refreshing to see Kidman taking on roles of independent woman that are fleshed out and worthy of her talent. Here she is fantastic as the head of the all girls school. She is a stern, no nonsense leader who puts her students before herself. Kirsten Dunst and Elle Fanning are also wonderful as two woman who are entranced upon the arrival of Corporal John McBurney. Dunst plays Edwina Morrow, a conflicted teacher to the students who is unhappy with her current state and tries not to give into the temptations provoked by Farrell’s McBurney. Fanning continues to tackle profound roles of young women experiencing some sort of sexual awakening, with prior films such as The Neon Demon, 20th Century Women, and Live by Night being of reference. Here she plays Alicia, a young lady who is attracted to the Corporal upon his arrival and fights to get his attention. The lust of the women for McBurney can be seen throughout the film and is a cause for tension for the duration of the film. Any gripes that can be made about the film have to do with the storytelling. Though Coppola might be going with the ‘less is more’ approach there are loose ends that are never tied and decisions that are made by characters that seem unmotivated with little explanation as to why. The film moves well with its 94 minute runtime but could have been enhanced with another 10 minutes or so added to it. That being said, The Beguiled benefits thanks to its precise production design, meticulous costumes, and the dreamy cinematography shot on film. The ensemble features a strong male lead but also a handful of well executed performances from actresses such as Kidman, Dunst, and Fanning. 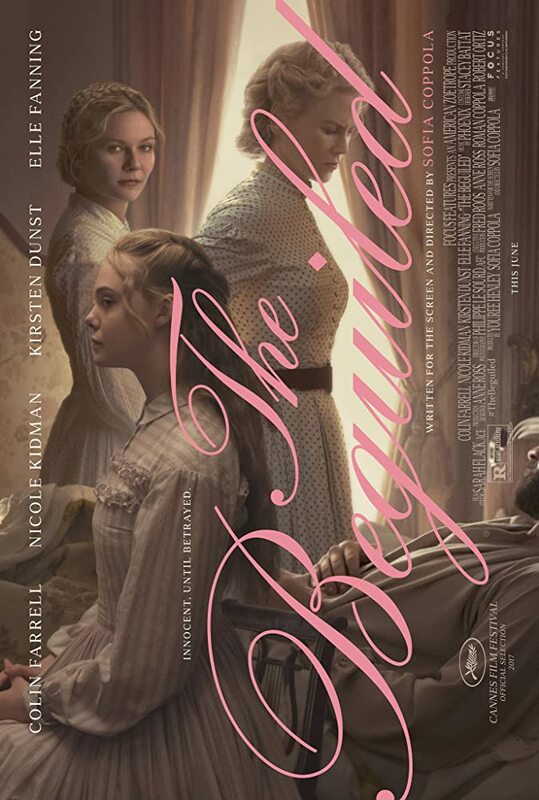 The Beguiled is a bold, artsy portrayal of a group of women that must learn to fight their own urges when a handsome, war torn soldier appears on their doorstep.